Once you have your eggs - you need to decide if you are going to incubate them underneath a chicken or using an artificial incubator. 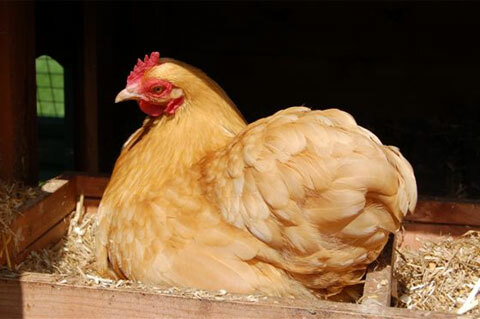 To incubate an egg naturally, you will need to have a hen which is prepared to sit on the eggs for a full three weeks. This is called a “broody” or “sitting” hen. 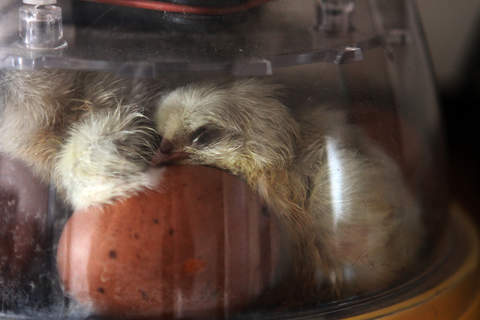 The eggs in the nesting box is called a “clutch” or “setting”. If a hen was doing this without human intervention, it would generally go broody when it has built up around a dozen eggs. If you have a large number of eggs or are incubating the eggs to sell then it might be worth considering using an incubator. 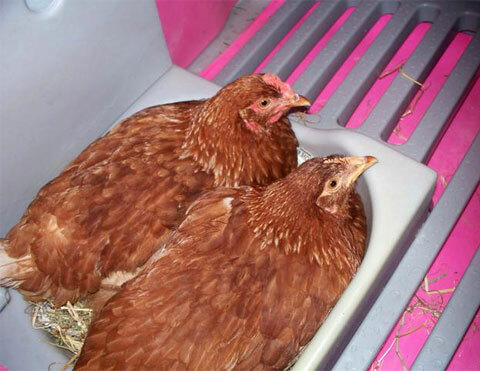 Two hens sitting on eggs in an Eglu Classic Chicken House. Some breeds are better “broodies” than other breeds. Unfortunately for breeders the broodiness trait has been bred out of many modern chicken breeds because a broody hen won’t lay any eggs and this mean the farmers have expensive non productive periods. The most broody chicken breeds are the Asil, Barnevelder, Brahma, Cochin, Delaware, Dominque, Dorking, Faverolle, Holland, Japanese, Jersey Giant, Maran, New Hampshire Red, Old English Game, Orpington, Polish, Plymouth Rock, Rhode Island Red, Silkie, Sussex, Welsummer and Wyandotte. If you have a modern breed of hen that has not been bred for reliable egg-laying - we recommend that you don't attempt to incubate your eggs with her. Even if she does start to sit on eggs - she might not sit on the eggs for the full 21 days and it isn’t advisable to use them. 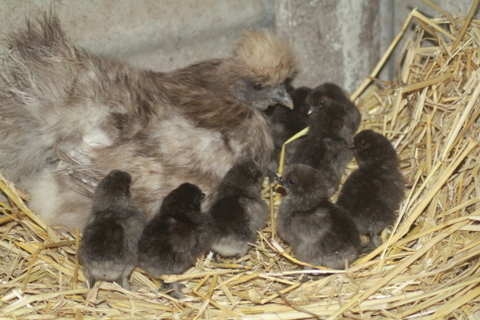 A Silkie chicken with her newly hatched chicks. If you like the idea of naturally incubating your eggs, and you have the right breed of hen, then you will need a your hen to go broody and sit on the eggs. You can encourage a hen to go broody by leaving artificial eggs in the nest for an extended period. 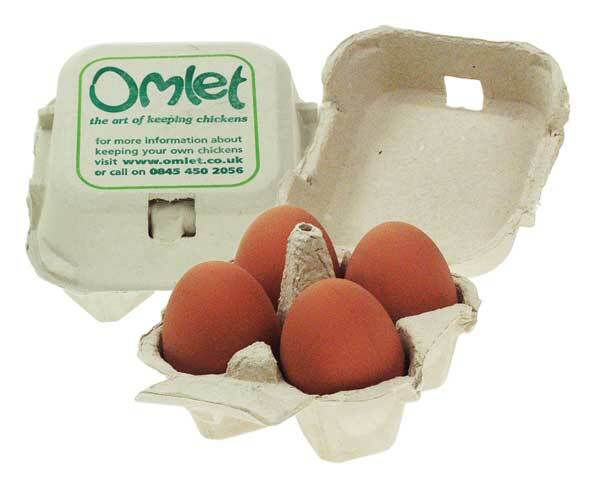 (You can buy artificial eggs from the Omlet Shop here.) You should place several in the nest and leave them for an extended period. Your hen might move on and off the nest for longer and longer periods. 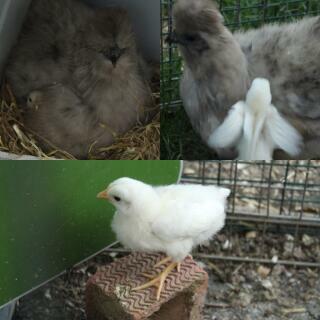 Finally, she might stay on the nest for at least 24 hours and then she is broody. Now you just need to place some real eggs under her to hatch! Artificial eggs look and feel just the real thing and can be used to fool a hen into becoming broody. Once the hen has gone broody - she will become very protective over the eggs and ward off predators (such as you) and to try to keep other hens from laying in her nest box. If you try to approach the nest or pick her up - she will make angry clucking noises and might attempt to peck you. A broody hen sitting on a nest. The eggs will only start to develop once the hen is sitting sits on top them. This means that all the eggs will hatch together. The hen will turn the egg regularly during incubation to ensure that the embryo doesn’t get stuck to the shell membrane, gases move around and the temperature is evenly distributed. The hen will then sit on the eggs for 21 days - only leaving the nest for short periods of time (about 20 minutes) to get feed, drink and generally have a run around. After 18 days, the chick will then start ‘pipping’ or breaking through the shell. You might notice your hen clucking to encourage the chick out. The chick will then take about 3 days to come completely out the shell. Great information my questis why would a brooding hen start to eat her eggs after sitting on them for 2 weeks?